None of the normal rules applied that day. On a regular day, the sun stays bright in the sky, only a few cars pass our house, and I stress out about hosting guests. But that day was different. I first heard about the solar eclipse of 2017 from our son Matt, an engineer and astronomy enthusiast in Washington, D.C.
“I’m coming home for it,” he announced. He sent me a map showing that the outside edge of the shadow’s projected path lay four miles north of us. We live on Substation Drive, an oddly situated little country road that has so little traffic it’s tempting to back out of the driveway without checking for cars coming. Paul’s sister Rosie invited all the Smuckers to camp at their place, well within totality, the night before. Traffic was going to be terrible, all the reports said. I ordered 35 eclipse glasses. As night fell, we gathered in spontaneous groups in Rosie’s backyard and talked. Matt held forth on politics from his insider’s view in Washington. Randy the nephew scoffed at all the warnings about heavy traffic. If anything, there was less traffic than usual, he said. The others nodded in affirmation. We settled into tents and campers that night, eager and expectant for morning. Rosie set out a brunch soon after sunrise, and Matt gave us minute-by-minute updates. Our daughter Jenny laid a white sheet on the ground, hoping to see the “shadow snakes” she had heard of. I handed out the protective glasses as though dispensing communion. Then, suddenly, for us and for thousands of others in Oregon, the first sliver of black encroached on the upper edge of the sun. United in excitement, we watched the slow progress of the determined moon until suddenly it clicked into place, the sun was impossibly dark, and we took off our glasses and looked around, up, everywhere. From my 100-year-old father seeing the first total eclipse of his life, down to giddy and slightly confused children, we all felt the same amazement, wonder and pure joy. Too quickly, it seemed, a burst of light appeared. The sense of awe gave way to a strange urgency to get going. Jenny left for her job, Paul left for the warehouse, and we moms gathered dishes and put blankets and people into vans. All the way home, we stopped at intersections to peer through our glasses at the sun as the moon slid off, left and downwards. We were surprised to see that Highway 34 was packed full, and so was the onramp to Interstate 5. We took the back roads home, a clear benefit to living here and knowing the alternative routes. We hauled coolers and blankets inside, constantly distracted by the increasing traffic past our house and at the intersection nearby. A pack of cars passed on Powerline Road. Another pack waited for them on Substation. We kept going outside to watch. So odd, we said, but surely they’ll clear out soon. Before long, both roads were filled with closely packed cars, and Highway 99, which angles across both Powerline and Substation roads half a mile away, was also packed, forming a triangle of traffic congestion never seen before. I felt sorry for all those people, stuck on unfamiliar country roads for probably hours. I wasn’t sure why or how, but I sensed it was imperative that I do something for them. What did I have on hand? A big tub of Smuckers lemonade powder and lots of tea bags. All right then. I stirred up a gallon of lemonade and grabbed a package of cups from the pantry while the water boiled and the tea steeped. 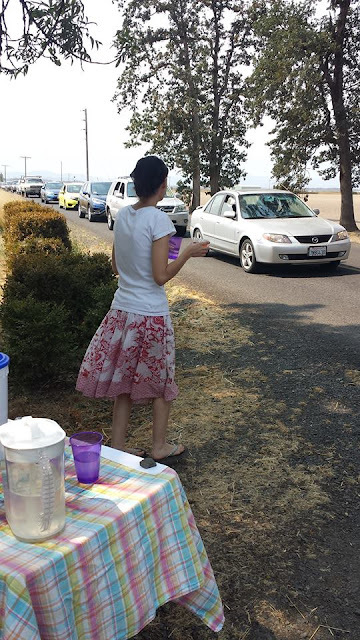 Then I set up a small table at the end of the driveway, feeling conspicuous and a bit embarrassed. What if no one wanted what I had to offer? There is an invisible barrier between traffic on the road and the perimeter of a home. I was shy about crossing it, about actually offering my gifts to those anonymous people behind their reflective windows. I made a “Help yourself” sign and considered leaving it at that and going into the house. I poured, and they approached cars and offered drinks, which was the best possible arrangement. Soon both pitchers were almost empty. I went to the house and made more. “By all means, come in and use ours,” I said. She pulled into the driveway and followed me inside. When she left, she thanked me and said she’s heading back to Pennsylvania, having driven all the way to Oregon for the eclipse. Surely there would be others who needed a bathroom, I thought. Two or three people, maybe. I grabbed another poster and wrote “RESTROOMS AVAILABLE” and hung it beside the other signs. Then I ran inside for more drinks. A few minutes later, I turned around from the kitchen sink and saw about 10 people forming a line from the bathroom door all the way out the back hallway. Soon, we had an efficient system. Simone and Emily handed out drinks and directed people to the back door. I showed people to the bathroom downstairs. Our son Matt directed others to the bathroom upstairs. I stirred drinks and hunted for more cups. 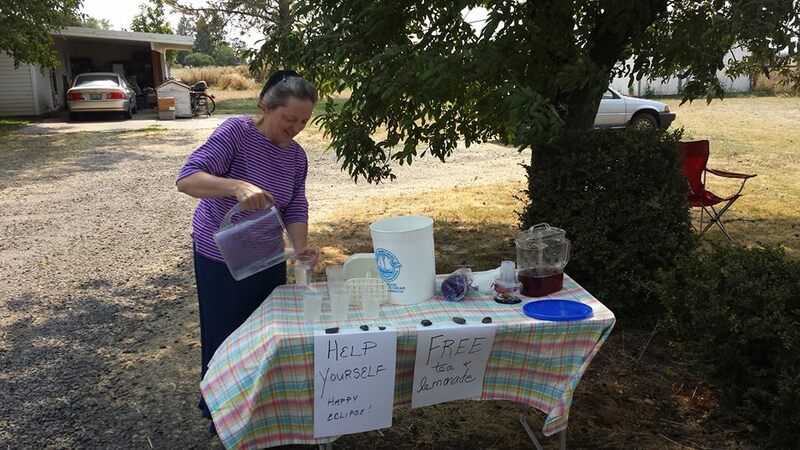 Outside on the road, people opened their windows, took photos, accepted drinks, offered money and thanked us profusely. Smiles and laughter abounded. When we ran out of cups, Emily biked to Simone’s house and found more in her pantry. Simone’s daughter Dolly came back with her and assisted as well. I chatted with the people standing in line. Probably 75 percent of them came from California — Los Angeles, San Jose, San Bernardino. Most of them had watched the eclipse at the coast. On the way back to I-5, their GPS programs had directed them on an alternative route down Peoria Road and east on Substation in an attempt to avoid the congestion on the larger highways. One family was from Japan. They and many others used the restroom and then lingered outside, expressing their thanks and enjoying the break. A family from China stood in the hallway, speaking in a language I couldn’t understand, but I understood their relief in finding a restroom for the grandma of the group. Many people seemed reluctant to leave, as though drawn to the strange magic of this day and this place, when nothing was as it normally is, and something special crackled in the sunny air. An hour passed. The cars were still creeping along all the surrounding roads. I ran out of ice so I quit making tea, but I kept stirring up lemonade with cold water from the faucet. After 10 gallons, I ran out of powder and we gave people cold water, gallons and gallons of it. It didn’t seem like enough, so I brought out all the cookies and brownies I could find in the pantry and freezer. The line in our back hall was almost continuous. Some people pressed money into my hand when they left. “To help with your water bill,” they said, and walked out before I had time to explain about farmhouses in Oregon that have wells and septic systems, but no water bills. Another hour and the traffic still hadn’t diminished. We were having the time of our lives, laughing, giving, pointing and helping. Finally, the cars decreased in number and moved a bit faster. The roads slowly cleared. Simone and Dolly went home. We left the drinks and signs on the table and went inside. Emily and Matt and I plopped on the living room couches and rested. “How many people do you think came through the house?” I said. Matt calculated 120 and I guessed 75, so we settled on 100. And how many drinks did we give out? At least 400, we guessed. How had we had enough cups, enough toilet paper, enough capacity in our septic tank? It didn’t seem possible. I suddenly remembered my prayer of weeks before, and goosebumps rippled up my arms. Among the day’s phenomenon, I realized later, was that all the kids and neighbors who showed up immediately plunged into this spontaneous project, without question. If anyone had asked, “Really? Why are you doing this?” I couldn’t have explained and, likely, I could have been talked out of it. It was a day when none of the normal rules applied. The sun set that evening in a strangely glowing pink sky, a final affirmation to a day of holiness and joy and miracles. The surprises continued the next day. Wow! What a day! I do enjoy your writing. Thanks so much. What a fun story! I'm sure all involved will never forget. Awesome! I liked how that last line summed it up....a final affirmation to a day of holiness and joy and miracles! Love how God can take an exciting occasion and turn it into a lesson!! Love this, Dorcas! What fun. Of all the eclipse stories I have read, this was, by far, the best. I felt like I was there. Beautifully written. Thanks for sharing how God creatively answered your prayer. I cannot express how much this blessed me! I brush away tears, and it gives me hope that God will bring people to me also, to bless! Thanks for sharing the story.